Wine and appetizer pairing is a great way to kick start the entire presentation. You have to be careful with wine and appetizer pairing because unlike any other part of a meal, appetizers are tricky to pair with wine because appetizers may range from spicy to savory or even sweet. Pairing food and wine is a sumptuous way to savor any meal, more so in important occasions like parties or even in simple get-togethers with friends and family. Attention to details is essential in wine and appetizer pairing in order to match the type of food you are serving along with the appropriate wine to go with it. You actually don’t have to be an expert sommelier to do the trick of wine and appetizer pairing but rather, you just have to have a little patience and interest for it. You also don’t have to worry so much about whether or not you chose the “right” one, as there really is no definite science behind wine and appetizer pairing. The goal of food and wine pairing is simple; you just have to complement the food and wine that will be served. In other words, these two should come together and match each other in terms of their flavor. If you are having a spicy appetizer, try pairing it with a white wine. White wines have a distinct floral characteristic and rich flavor with a hint of spice that’s why it also suits best with savory appetizers to neutralize the flavors and enhance the overall dining spree. On the other hand, red wine can be paired of with a lot of variety of flavors when it comes to appetizers. Although others may like white wines over red ones or vice versa, it’s actually also about individual preferences. So if you are still in doubt, there are actually many versatile wines out in the market, like Conundrum and Purple Mountain Merlot, which can go great with any holiday parties. 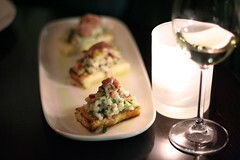 Ultimately, wine and appetizer pairing is a fun way of having a twist in your usual dining experience.